Yesterday marked the 51st anniversary of the Association of Southeast Asian Nations or ASEAN. As per tradition, it was Hanoi’s turn this year to host the annual flag-raising event, where the ASEAN flag is raised to commemorate ASEAN Day. 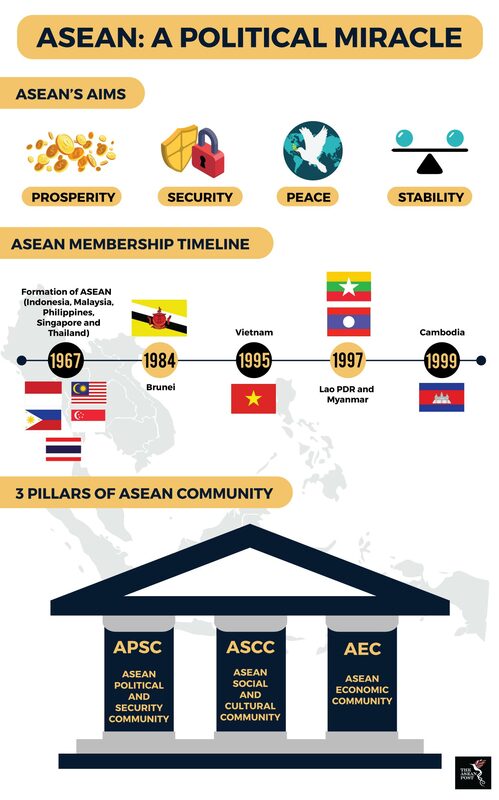 ASEAN was formed on 8 August, 1967 by five founding member nations – Indonesia, Malaysia, Thailand, Singapore and the Philippines – against a backdrop of hostilities and conflict in the region. Most ASEAN states at the time were newly established nations, having removed themselves from the shackles of colonialism and in the midst of nation building and finding their own identities. It was also the height of the Cold War where communism was seen as the biggest threat to the region. Many countries were having difficulty containing the spread of communist influence. The establishment of ASEAN was seen as an antidote to communism in Southeast Asia. The ASEAN Declaration was signed by the five founding countries and has since become the basis of every single decision and undertaking made by ASEAN over the past five decades. The declaration sets out the aims and purposes of ASEAN. These include the need to accelerate economic growth, social progress, and cultural development in the region, to promote regional peace, and the collaboration and mutual assistance on matters of common interest. Over time, ASEAN’s role has evolved to include economic, societal and political integration. ASEAN leaders get together to discuss issues and challenges and to formulate strategies for the region twice every year at the ASEAN Summit. What was once an agrarian backwater struggling with poverty less than a century ago is now one of the most exciting regions in the world. ASEAN has a combined gross domestic product (GDP) of US$2.4 trillion, and is the third fastest growing major Asian economy after China and India. In terms of technology, the region is quickly evolving into a global hub with a robust tech startup scene and is currently home to a number of unicorns such as Grab, Sea and Go-Jek. “Looking back, ASEAN helped transform Southeast Asia from an area of enmity into a region of amity; from a pocket of poverty into a land of opportunities, and; from a zone of instability into an ecosystem of peace, stability, and prosperity,” said Foreign Minister of Indonesia Retno Marsudi in her speech during the 51st anniversary celebration at the ASEAN Secretariat yesterday. Increasingly over the past five years, ASEAN’s role in global geopolitics has grown significantly larger. Currently, Southeast Asia has become a battleground for China and the United States (US), with both superpowers fighting for global dominance. China’s presence in the region has been celebrated by some quarters as it continues to pour money into financing infrastructure projects throughout the region. Conversely, China’s militarisation of the South China Sea has left many concerned about the safety of surrounding ASEAN member states. Meanwhile, the US has been pushing the line of a “free and open Indo-Pacific” to counter China’s assertions in the region. ASEAN’s role in all this could not have been made any clearer than in US State Secretary Mike Pompeo’s congratulatory message to ASEAN. “I am honoured to congratulate the 10 member states of the Association of Southeast Asian Nations (ASEAN) and the ASEAN Secretariat on the organization’s 51st anniversary on 8 August,” said Pompeo. “I welcome ASEAN’s role as a centrepiece of the Indo-Pacific’s regional architecture and its contributions to a free and open Indo-Pacific region,” he added. There are also major humanitarian issues at stake in Southeast Asia. The crackdown on the Rohingya in Myanmar has been described by observers as “ethnic cleansing” and has led to a refugee crisis with nearly 700,000 Rohingya having to flee their homeland and seek refuge in neighbouring Bangladesh. With monumental challenges ahead for ASEAN, pertinent questions arise. How does ASEAN maintain its centrality when dealing with two powers such as the US and China? How does ASEAN solve a humanitarian crisis like the Rohingya issue while maintaining its non-interventionist principles? These questions are difficult for ASEAN to answer and the bloc’s response could possibly shape its future. One thing is certain; with ASEAN’s growing geopolitical importance on the global stage and its thriving economy, the future of this association has never been more exciting.